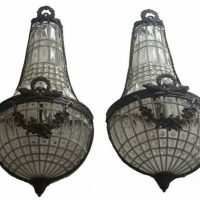 Sconce Size is about: 20 X 8 X4 inches. 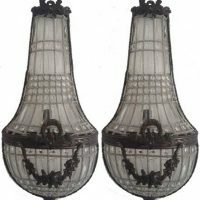 The sconces are handmade and little size variation up to 1/2″ might occur. Wall mounting supporting brackets are not included in the sale. 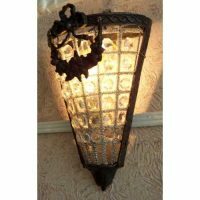 Category: Basket Crystal Sconces. 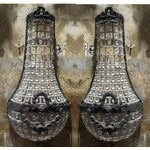 Tags: brass crystal beads sconces, crystal hand beaded sconces, Crystal Wall Sconces, French empire wall lamps, half round wall lamps, handmade sconces. 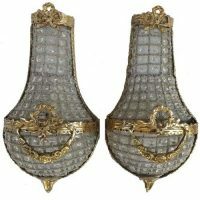 antique reproductions of late 19th/early 20th century style. 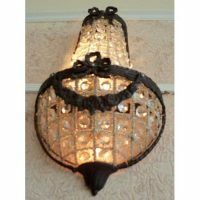 The rustic antique wall lights are hand strung of various beads sizes including thousands labor intensive tiny eye beads, 14 mm beads prisms and long beads. All are supported by unseen metal wire basket cage underneath. 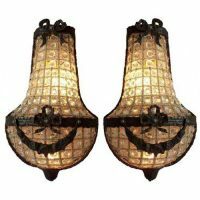 The light shades out of the Vintage Antique Crystal sconces will look wonderful anywhere you want your guests to feel extra welcome. 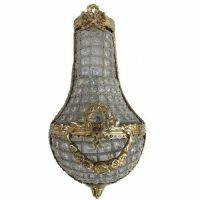 This stunning crystal sconces will catch the light and create a richly elegant ambiance in any room.. 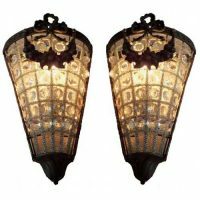 The shine of the sparkling crystal beads prisms is enhanced by antique look patina bronze finish. 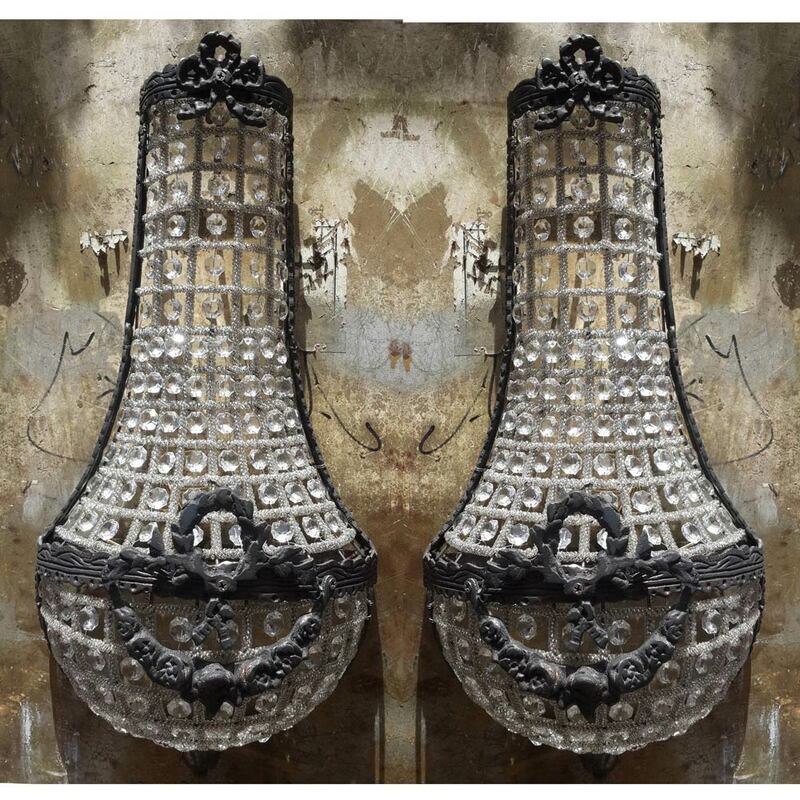 This basket cage chandelier will add a sophisticated touch to any dining or hall room. It will retains brilliance and splendor for years to come. The buyer might use adapter or socket reducers to alter European light parts or rewire the sconces according to the US or local electric standard. Wires, bulbs are not included in the sale. 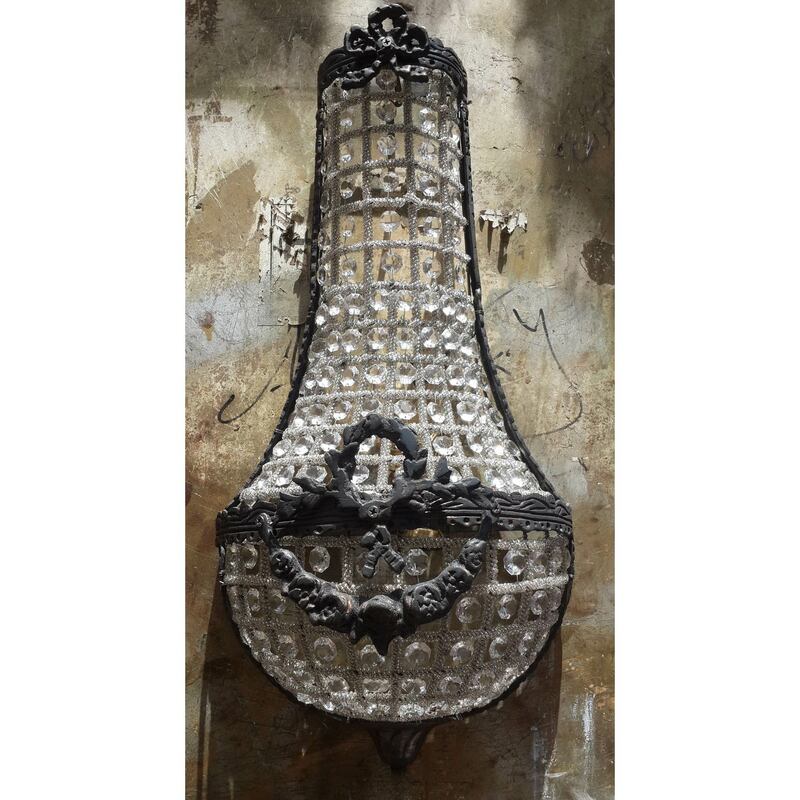 The sconces are electrified and wired in Egypt using available local fixtures. Each sconce has 2 E14 European universal sockets. USA and Canada use E12 bulb bases. Adapters or rewiring is required. Bulbs are not included in the sale. Buyer full satisfaction is guaranteed. Buyer should contact us in case of any problem upon receipt of order. 20" X 8" X 4"